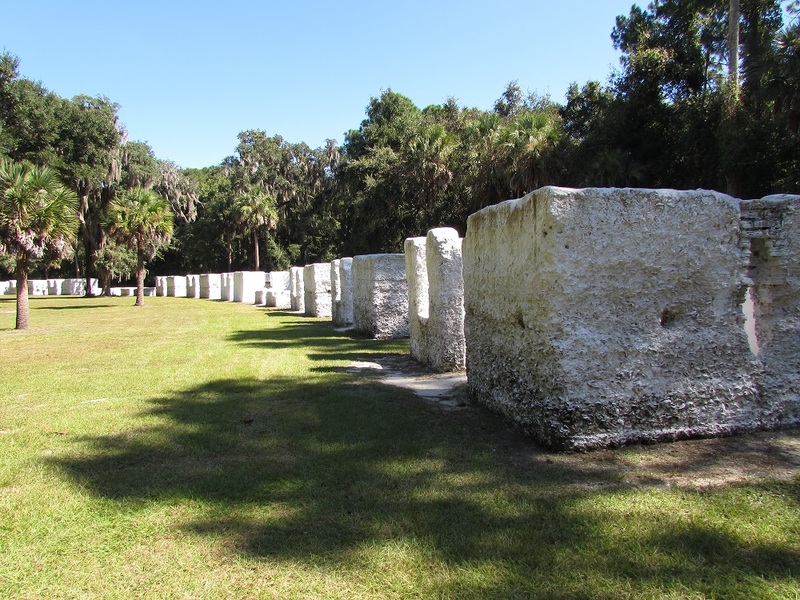 The most striking part of Kingsley Plantation on Fort George Island in Florida is its slave cabins. They are solid, white, and made of tabby — a building material consisting of oyster shells, lime, sand, and water common to the southern Atlantic coast in the 18th century. There are 25 of them (from an original 31), perfectly positioned in a neat semi-circle not far from the main house. The main house was built in 1798 by the slaves of John McQueen, and is the oldest plantation house still standing in Florida. 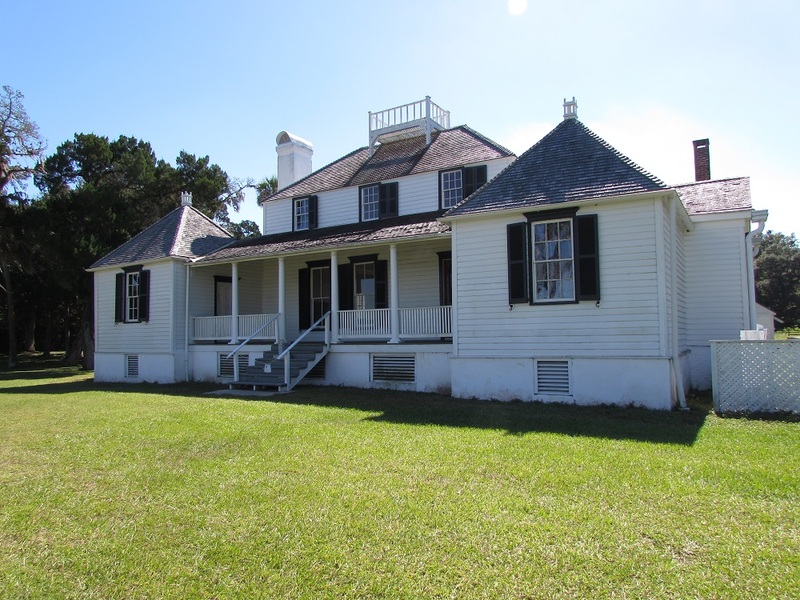 What I found interesting about the Kingsley plantation house: its widow’s walk. I’d been told at Mount Harmon Plantation in Earlesville, Maryland that widow’s walks were a feature of houses only in New England (Mount Harmon had one that was added in the 20th century). 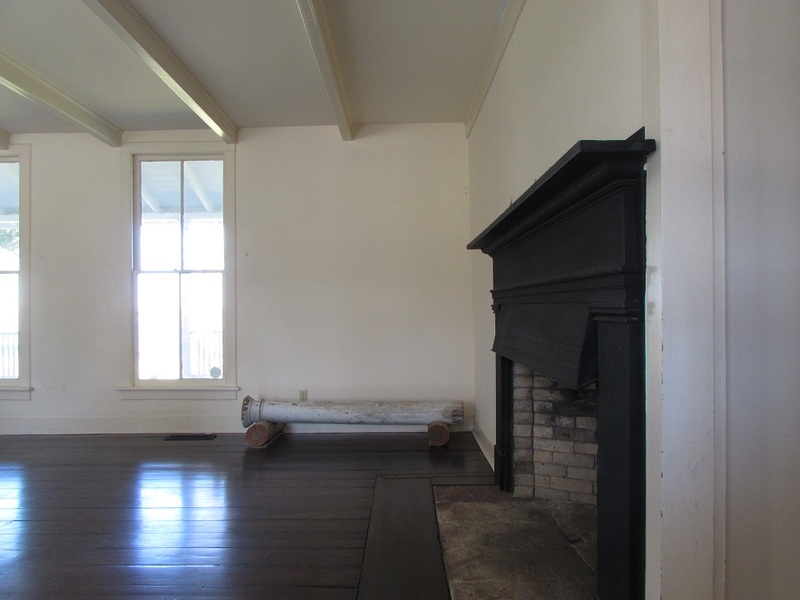 The NPS ranger at Kingsley confirmed, however, that the one on the Kingsley house was original to its 1798 build. We didn’t see the interior because it’s only open on weekends and we were there on a weekday. I took some shots through the window. But it’s neither the main house nor John McQueen that was the focus of the property’s narrative, anyway. The site, after all, isn’t called the McQueen Plantation. It’s named after a later and much more interesting owner. Zephaniah Kingsley was born in England in 1765 and raised in South Carolina, where his parents were plantation owners. By the age of 25, he owned a ship and was slave trading between Africa, the Caribbean and the States. He was a hands-on business owner, sailing on his ship as business manager when she made her voyages. It was on such a voyage, to Cuba in 1806, when his story takes an unusual turn. He buys a 13-year-old Senegalese girl named Anta Majigeen Ndiaya. But that’s not the unusual part. The unusual part is that he then marries her in what he would later describe as an African ceremony. However it was done, there’s no question — based on his own and other written contemporary accounts — that he and the rest of the world considered and treated her as his wife. They settled on one of his many plantations, called Laurel Grove, in Spanish-ruled north Florida. In 1811, when Anta — now known as Anna Kingsley – was 18, Zephaniah freed her and their three children. Anna runs the plantations when Zephaniah is away and by 1813, she is a plantation and slave owner in her own right, buying property across the river from Laurel Grove. Around 1814, the Kingsleys move to Fort George Island, to what is now called Kingsley Plantation. Zephaniah, like other slave owners in Spanish territories, practiced the “task system” on his plantations. Slaves were given tasks for the day and once those tasks were finished, the rest of their time was theirs to do with as they liked. Slaves also were legally people, with rights under Spanish law. It was very different from the gang system in place in the United States to the north. So slave laws in Florida were different from slave laws further north until 1821, when the US purchased Florida from Spain and the English system came to Florida. Afraid that his family would be sold back into slavery under US law, Zephaniah bought land in Haiti and moved his family there. Kingsley Plantation is part of Tumucuan Ecological and Historical Preserve, administered by the National Park Service, and some parts of the NPS narrative about Anna and Zephaniah just didn’t fit together. I can’t remember exactly what it was that raised my antennae, but I think it had to do with the number and ages of Zephaniah’s children. Anyway, a little research and I found the story that NPS wasn’t telling: Zephaniah was a polygamist. While Anna was considered his primary wife — and to the monogamist society in which they lived (and to the NPS, apparently) his only wife — he considered himself married to several other African women as well. He freed them all, along with their children, and they all lived as a family unit. When Zephaniah died, he left all of his property to his wives and children. Anna returned to the US from Haiti when Zephaniah’s relatives contested his will, claiming that his wives and children were slaves and therefore could not inherit property. She fought them in court and won. Gallery | This entry was posted in Florida and tagged Anna Kingsley, Anta Majigeen Ndiaya, Fort George Island, Tumucuan, Zephaniah Kingsley. Bookmark the permalink. A wonderfully enlightening post. 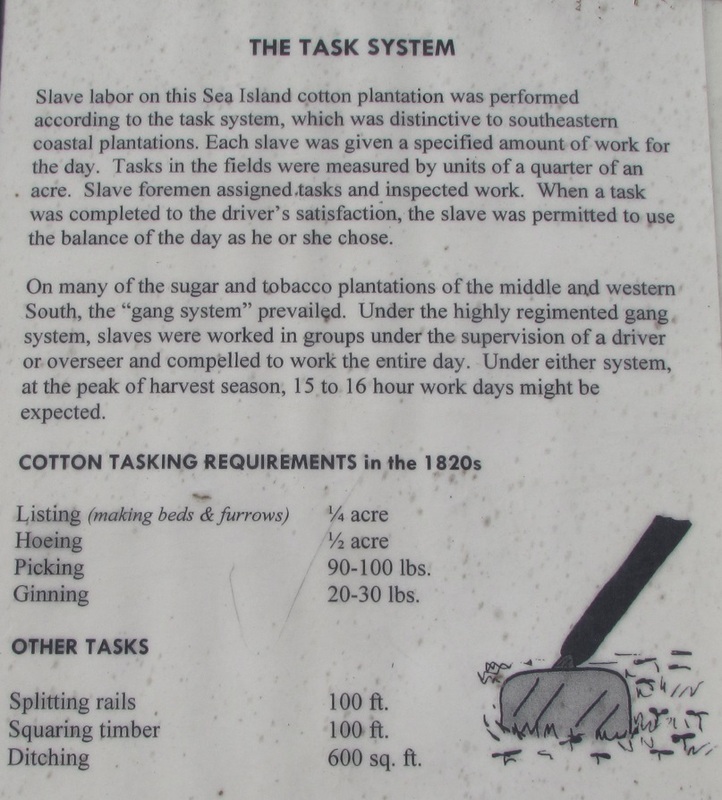 I had never heard of the “task” system, nor of this plantation. Extraordinary! Thank you.. The Kingsley story was the most interesting one I’d heard at a historic site in a long time. Thanks for coming by and commenting. Very interesting story – I have heard a few stories about black slave owners, but not the task system. Those slave cabins are fascinating! I’d never heard of the task system, either. I was super impressed at how well those cabins had stood up through time. We have a similar system. Kim goes to work and gives me some tasks and when they are done I am free to go to play golf! The cabins are interesting, they look like the white cube houses of the Greek Cyclades. That’s very kind of Kim, to give you enough time to play golf. Although, how can she be sure that you’re doing your tasks correctly, and not just quickly. Will have to take your word about the houses of the Greek Cyclades, since I’ve never been. Definitely on my bucket list, though. Never heard of the Task system either – seems slightly more humane than the brutal conditions on the mainland. Wonder what Zephaniah’s family in South Carolina thought about his way of life – what would have been more shocking – a mixed race marriage or multiple wives? And an original Widow’s Walk! The tours in New England say that the name is a romantic misnomer created in the 20th century. More likely used by obsessive Yankee ship owners to keep an eye out for their incoming property.